Do you provide the glass for glass doors or french lites? Will I receive shipping updates or tracking information? What type of warranty or guarantee do you offer? How can I order something that is not on the site? What is a center rail? How do I order different Left and Right Preboring options for the same size doors? What if the delivery service is unable to reach me by the phone number provided? What is the difference between a door and a drawer front? How do I install the glass for my glass or french lite door? What is MDF? When is it recommended to use MDF instead of wood? How do I add a shipping address? Why is my payment being denied? Why does my bank show it's being processed? What are the matching arched or square doors? How do I match door styles? Do you sell Lazy Susans? Our goal is to make our customers 100% happy and satisfied. CabinetNow wants you to buy your new custom cabinet doors with the assurance that you will be completely satisfied with your purchase. Please call us Monday to Friday, 6am to 6pm PST at 1-855-669-5222 with your question or concern. Are you a contractor? Need a quote for a large order? We are happy to provide homeowners and contractors with custom quotes for large orders. Contact us at: 1-855-669-5222 or by email at info@cabinetnow.com, we be would be happy to work up a custom quote. Email inquiries submitted before 4:00 p.m. Pacific time are answered on the same business day. Please send your inquiry to info@cabinetnow.com . Our live chat agents are available to assist you. Live chat is available during normal business hours. Click here to chat now. If you are replacing your doors and drawer fronts, and you are reusing the same hinges all you need to do is measure the current doors and drawer fronts (largest width and height). And order the new doors this size. If you want to change your hinge style, or how the doors fit onto your current boxes, pretend as if this is “new construction”. Add the overlay distance you want. This is how far you want your doors to go past the opening of the cabinet. We recommend having “split doors” for any opening over 24” wide. Split doors have 2 doors per opening. This will allow for even overlay, and space in the middle for the doors to open and close properly. 36" + 1" = 37"
Orders go into production immediately and cannot be changed once they've been placed. Orders placed after 3pm EST typically go in to production the following morning, or the next business day. We are currently at 8 business days for production, and the shipping time depends on your location. Shipping will take between 1-8 business days. Shipping to both Alaska and Hawaii will be for freight, which can take up to 3 weeks. Please refer to the service maps below to estimate your delivery date. Please be aware of the delivery and phone schedule through the Thanksgiving, Christmas and New Year's Holidays. Thanksgiving - We will be closed Thursday. Phones will be open the following day. Christmas and New Years - Normal deliveries will run thru December 22nd. We will have no deliveries from December 22nd thru January 2nd. Normal deliveries will resume on January 5. Our phones will be closed December 24th thru 26th & January 1st and 2nd ONLY. Offices will be open the rest of the time to process orders and answer any questions you may have. If you have any questions regarding the schedule, feel free to contact your inside or outside sales representative. We appreciate your business and look forward to this next Year! Your billing address needs to match the address associated with the credit card for a payment to be approved. But the shipping address can be anywhere in the US. TIP: You can add as many shipping addresses as you need, just make sure you select the one you would like the current order shipped to during Checkout. Why is my payment being denied? The most common reason your payment is denied is because your billing address is not matching what your bank has on file. Denial reasons are usually from the bank and not from our payment processor. If you receive a denial message, we will NOT be collecting payment from your account. Your bank may show the charges as pending, and it is their responsibility to release the charges back to your account. All orders must be paid for online. We do not take credit card information over the phone for your own protection. All of our calls, chats and emails are recorded for quality assurance. All measurement information must be entered in decimal form. A conversion chart is listed on each product page for your convenience. As always, if you need assistance please contact one of our customer service professionals at 855-669-5222 or by live chat. How do I order something that isn't on the site? Can I get slab doors and/or fronts? We have several ways of adjusting the styles on our website and can often do custom orders for an additional charge. You can call us at 1-855-669-5222 or email us at info@CabinetNow.com. To save the items in your cart you must first create a CabinetNow.com account and be logged in. To create an account visit the “my account” page at the top of our website. Once you have created and logged into your CabinetNow.com account all items added to your cart will remain in your cart until you remove them on the view cart items page. You can safely log out at any time, knowing that the next time you log in, the items in your cart will still be there. Please click here Match My Cabinet Doors to upload your pictures. Please note it can take up to 24 hours for an associate to get back to you. Will I receive status updates and tracking information? Processed- This status confirms that your order and payment have been received and verified. In Production- This status indicates that the manufacturer is building your order. This takes approximately 6-8 days. We will provide an estimated ship date when available. Shipped- This status notifies you that your order has shipped. We provide your tracking number(s) and a link to the carrier's website to track your shipping status to delivery. Delivered- This final status confirms your order has been delivered. We provide a form and appreciate if you can complete the brief customer service survey to improve our business. A center rail is a horizontal rail crossing the center front of the door for stability, and it creates a 2-panel appearance. We recommend Center Rails on all doors over 50” for stability to prevent warping or twisting. If you choose not to add a center rail to any doors over 50” there will not be any guarantee against warping or twisting. To request a Center Rail, you will specify in the Additional Instructions section on the last page of checkout. We can do custom placement or more than 1 Center Rail for an additional charge. The difference between doors and drawer fronts are the dimensions, the grain direction, and the width of the rails and stiles. The grain in a door panel runs vertical (up & down), while in a drawer front, the grain runs horizontal (left to right). Typically, door stiles/rails are 2 1/4” to 3” wide, while drawer fronts will have reduced rail widths to approximately 1 3/8”. Although drawer fronts are small, they are labor intensive to make, and the grain direction runs horizontally, which cause the increase in costs. What type of Warranty & Guarantee does CabinetNow.com offer on cabinet doors? Due to the custom nature of our products, it is very important that you read our full Specifications, Warranty & Guarantee page for important details. 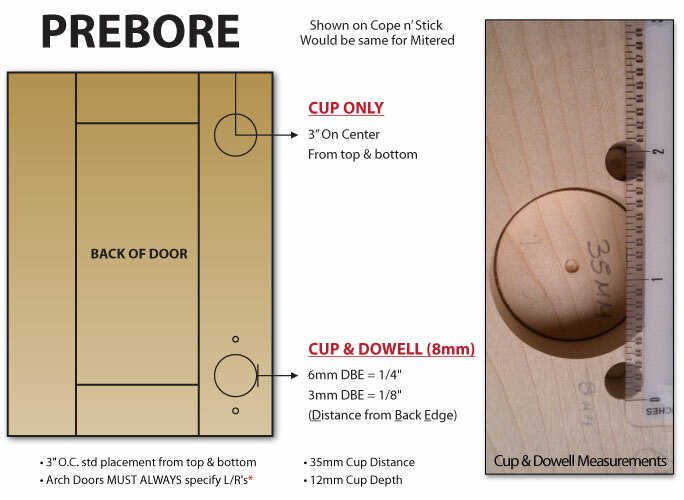 Prebore means your doors will arrive with holes already routed out for European / Concealed style hinges. Cup only prebore is used for "screw on" style hinges, where the hinge is attached to the door with wood screws. Cup and Dowel prebore is for "press-in" style hinges that come with special screws and plastic dowels used to attach the hinge to the door. The choice between 3mm and 6mm refers to the distance from the edge of the door to the edge of the hinge hole and will be determined by your hinge model. You will need to consult the specification sheet for your hinge. The illustration below explains the different preboring options available. How can I order different Left and Right Preboring Options for the same size doors? Specifying Left or Right is only necessary for arched doors. Any symmetrical rectangle door can just be flipped around, as it is the same on all sides. When ordering arched doors, you will have additional options for Left and Right prebore. Simply add each door individually and choose the appropriate option from the prebore drop-down box. Which square door matches my arch? Do you provide glass doors? Most of our cabinet door styles can be prepared to accept the glass, but we do not provide the glass. For doors made for glass, Lites refer to separately framed openings. It is a term used to define the number of openings you would like. The separations are created by wood dividers called “Mullions”. We offer 4, 6, 8, 9 and 11 Lites. MDF = Medium Density Fiberboard, which is very similar to particle board but denser. MDF is typically only used for painting. How do I install the glass for my doors? You can install with either rubber or wood stops, which we sell at time of purchase. We recommend rubber stops, as they are easier to use. If you choose the Rubber Stops, we will provide a rubber rope with the doors, long enough for the inside perimeter of the frame. You cut the lengths to fit the frame pieces and insert them into a groove made to accept the stops. All of the glass doors are routed to accept 1/8" thick glass. You may also choose “No Stops” if you prefer. Why didn't I receive an email confirmation? There are various reasons you did not receive an email confirmation. The order was not complete, due to issues beyond our control. In most instances you will notice that your items remain in your cart. You have misspelled your email address. Double check that the email address you registered with is correct. Your may also want to check your SPAM inbox to see if the confirmation email went there. What if delivery services are unable to reach me by the phone numbers provided? If we are made aware of this issue, by the carrier, we will contact you to set up delivery. If we are unable to reach you by phone or email, the carrier will hold your shipment. In which case storage fees will accumulate, and you will be responsible. You can call the carrier directly, with the tracking information we have provided you. If your shipment is returned to our warehouse, you will be charged for redelivery fees. If you need further assistance, contact us at 1 (855) 669-5222. Do you sell doors for Lazy Susan cabinets? Any of our doors can be used for a Lazy Susan application. The important thing to know is how you will be installing / attaching the doors to your cabinet. 3 of the 4 sides of your doors must be square, so we recommend using Shaker style cabinet doors. Measure the opening and add overlay amount to hinge side of door only. The stile where the corners touch must be square. For the “Top” door - Measure the opening and add overlay amount to hinge side of door only. then subtract 13/16” (thickness of the door it will sit on). For the “Top” door - Measure the opening and subtract 1/8”. Then subtract another 13/16” (thickness of the door it will sit on). Thanks for helping us to get to know you.